The graphics will dazzle you, the speed will astound you... but if you don't think fast and shoot faster, you won't have a choice against the alien firestorm. Because in Super E.D.F. 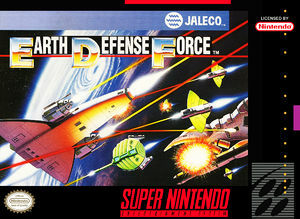 : Earth Defense Force, the best defense is always a great offense. So get ready to hit first and hit fast in the hardest-hitting adventure to hit the Super NES'a screen! The graph below charts the compatibility with Super E.D.F. : Earth Defense Force since Dolphin's 2.0 release, listing revisions only where a compatibility change occurred. This page was last edited on 28 December 2017, at 15:34.